Please join us in the garden at on July 7th for the launch of this project. There will be free seed packages and a garden potluck. Bring a dish to share if you like. Now We Plant is a collaborative art installation led by Christina Bechstein that brings together gardeners, neighbors, and friends with the Boyd Street Urban Farm and Cultivating Community. Through yard signs, widely distributed seed packages, and community interactions, Bechstein creates a vibrant and diverse exchange of recipes as well as visions of the American dream. 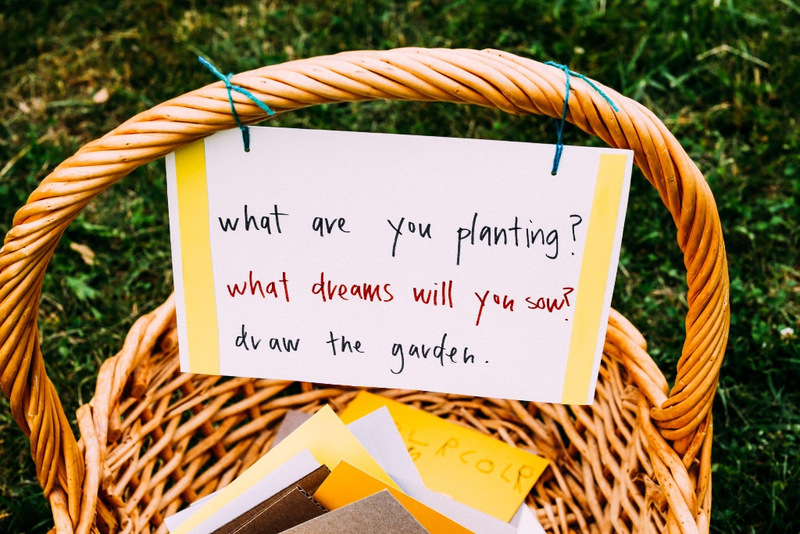 In a project rooted in partnership and interchange, the vegetables and herbs–grown here and from the seed packets–become the basic sustenance of community engagement, reminding us of the importance of tending to both our collective environment and dreams. Boyd Street Urban Farm, corner of Cumberland and Franklin Street arterial, Portland Maine USA. The Boyd Street Urban Farm is a community garden in downtown Portland that serves nearby Kennedy Park neighbors. In the heart of Maine’s most diverse census tract, BSUF encapsulates the potential impact of agriculture in a culturally rich, economically challenged urban area. The idea of turning city spaces in very poor health into vibrant farms that support youth programs as well as individuals/families who want to work in the soil is essential to the vision of a local, sustainable food system. For more information about the garden, please contact Laura Mailander, Cultivating Community #207.761.4769 ext 855. The Boyd Street Urban Farm and the gardeners, Cultivating Community and it’s Youth Growers, Laura Mailander, Zainab Imran, Maher Al Asadi, Jennifer Muller, Sandrine Chabert, Dara Lestrade, Sarah Marshall, Sister Makings Group, Charles Schreiber, Papa Mendy, Tempo Art, Alice Spencer, Andrew Eschelbacher, Anne Marie Levine, Bonnie Norlander, Laci Hoskins, Skillins Greenhouse, Johnny’s Seeds, The City of Portland and The City of Portland Public Art Committee, friends and neighbors to the garden. Christina Bechstein is an artist and mother who has taught in art, design, and architecture programs across the United States. Bechstein’s record of international exhibitions and lectures include Museu d’Art Contemporani de Barcelona, Spain; Bates Art Museum in Lewiston, ME; Harvard University in Cambridge MA and more. She has studied at Cranbrook Academy of Art and Skowhegan School of Painting and has been the recipient of fellowships and awards from places like the Massachusetts Cultural Council, the New England Foundation for the Arts, The Graham Foundation and Weimar Jena Akademie. Her creative practice is interdisciplinary and collaborative in nature, encompassing and overlapping such fields as public art, sculpture, textiles, community based art and activism. In her landscape based projects, she investigates the role of art in place-making and community-building. These projects, like ‘Now We Plant’, convene diverse neighbors of all ages and backgrounds around a creative project, food, sharing and imagining to co-create the places we call home.